It looks like Meatless Monday’s “Inspiring a Movement” video is doing just that, but the meat industry is already grumbling. In particular, industry leaders have a beef with the video’s claim that, “Meat mass production, as currently practiced, is extremely inefficient.” The claim makes sense to me, especially when you consider research that suggests the amount of energy needed to produce industrial raised beef is at least 10 times greater than growing vegetables. But, wait I’m getting ahead of myself. With my Industrial Ag proponent hat on, I could see why the statement would ring untrue. I can imagine hearing a poultry scientist say, “What are you talking about? Thanks to the industrial system, careful genetic selection and specially formulated food we only need half as much feed as farmers used just 50 years ago to produce the same amount of meat. 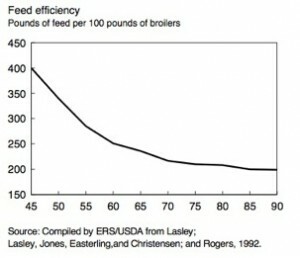 Take a look at this USDA graph depicting just how far “feed efficiency” has come since the end of WWII. It sure is impressive. But all this means is that Ag scientists have been able to make the hugely inefficient industrial food animal production (IFAP) system a little less so. Case-in-point, let’s compare IFAP to, say, growing fruits and vegetables or raising food animals on pasture. According to one estimate, the ratio of fossil-fuel energy needed to produce one unit of food energy is 35:1 for beef production compared to 3:1 for all U.S. agricultural products combined (Horrigan et al, 2002). Hmm, that doesn’t sound very efficient. Now let’s talk about external costs of IFAP. Just what are these external costs? For one, it’s the dependence on subsidized animal feed. Without the government’s (i.e. taxpayer dollars) help in making grain cheaper than it costs to actually produce, the so-called industrial efficiencies would start to fade away. But that’s just the tip of the iceberg. Animal waste from industrial operations is polluting our drinking water and waterways and creating health hazards. We raise more than 10 billion animals a year, mostly poultry, but did you ever wonder where all their manure and urine goes? The majority of it is spread or sprayed on the ground. In small amounts these nutrients make great natural fertilizers, but under the industrial system, livestock growers are forced to spray or pump millions of gallons of liquefied manure and urine onto cropland, beyond its capacity to absorb them. In addition to all the petroleum-based fertilizers used to grow animal feed, many of those nutrients flow into creeks, streams, rivers and eventually the ocean, creating “dead zones” that kill aquatic life. Manure from industrial farms contains nasty stuff such as antibiotic-resistant bacteria and arsenic. An Iowa State study estimated that the “external costs” of agricultural production in the U.S. – in terms of natural resources, wildlife and ecosystem biodiversity, and human health – amount to between $5.7 and $16.9 billion annually. Livestock production alone is estimated to contribute $714-$739 million. (Tegtmeier & Duffy, 2004). I wonder if this is factored into AMI’s efficiency claims. If you want to learn more about how IFAP affects public health, the environment, communities, and animal welfare check out the Pew Commission on Industrial Farm Animal Productions website. Ralph Loglisci, a national food and healthy policy writer and media consultant, served as the director of communications for several national organizations, such as the Pew Commission on Industrial Farm Animal Production, The Berman Institute of Bioethics, and Wholesome Wave. Additionally, Ralph spent several years as the Project Director for the Johns Hopkins Healthy Monday Project based at the Johns Hopkins Bloomberg School of Public Health’s Center for a Livable Future (CLF). I would like a copy of the Pew Study ……. but please leave out the photos and save paper! Thank you! I am going to spread the word about Meatless Mondays! I’m a senior in Crop Sciences at the University of Illinois. We’ve been focusing on the comparisons of vegetable, crop, and meat production in terms of environmental implications. Your argument seems to be extremely one sided on this issue. Don’t forget vegetable production also requires fertilizers and chemicals that you seemed to side-step in your discussion. What about the protein, amino acids, and iron found in meat that is at such a higher concentration than what is found in vegetables? Don’t forget that the majority of the grains produced in the US, which I wouldn’t say “require,” but do use lots of fertilizers and chemicals, are used to feed livestock. This research is rediculous. The “35:1” ratio is totally biased. How many people do you know of that are ruminants and can digest hay? silage?…didnt think so. Next time factor in all variables before you post this nonsense.